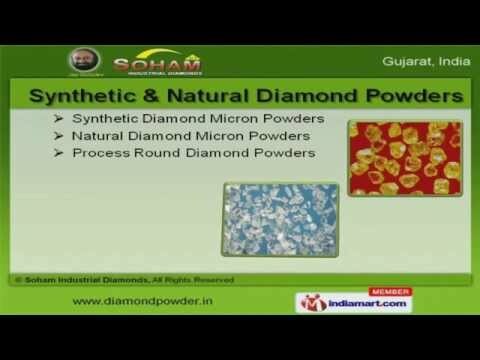 Welcome to Soham Industrial DiamondsManufacturer & Exporter of Natural and Synthetic Diamond PowderThe company was incepted in 1992, at Surat. Our Strong distribution network & Teamof industrious professionals help us to cater Indian Subcontinent &East Asia. R. S. Engineering & Sapphire Industries are some of our prestigious clients and we arebacked by Market leading prices & Ethical business practices. We offer a vast range of Bruting, Synthetic & Natural Diamond Powders. Our Synthetic & Natural Diamond Powders are best in the industry amongst others. Process Round Diamond offered by us are in huge demand across the global markets. Our Elongated Process Stick Diamond are a class apart. We also provide Bruting & Synthetic Diamond that are widely acclaimed in the market. Along with that we offer Natural Micron Diamond Powders that are available at industryleading prices.